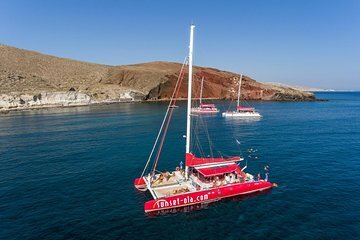 Passez la journée à naviguer autour de la belle Santorin sur un catamaran. Imprégnez-vous de quantités illimitées de vin blanc et d’eau et offrez-vous un délicieux barbecue préparé à bord du catamaran tout en naviguant dans les magnifiques eaux bleues de la mer au large de Santorin. Cette croisière de grande valeur est un moyen abordable de profiter du célèbre paysage volcanique de Santorin. I think this trip is probably pretty good normally, but the day we wen it was cold and rainy. Also, since the water was rough, we were unable to go to Red or White sand beaches. I wish they would have delayed it for better weather. We don't feel like we got our money's worth. We chose this excursion because we only had 2 full days in Santorini and thought this was a great way to see some of its beaches/hot springs and views from a different angle. And I'm so glad we did! They were punctual picking us up from the hotel, the boat looked brand new and spotless, the crew was very professional and helpful, and the BBQ was delicious! We had about a 30 min - 1 hour stop in each beach. The hot springs was about 15-20 mins stop, but they weren't hot anyway so that was ok. I would definitely recommend this tour! The catamaran cruise was one of our favorite parts of our trip! Everything was as described in the listing. Pickup and drop off was very easy and convenient. The cruise itself was beautiful and the crew was entertaining and fun. The BBQ was delicious. We highly recommend you take this cruise while in Santorini! Nice cruise, clean, safe with friendly staffs. Got 3 times to swim in the open water, but cannot swim to the beaches, as not enough time. Food was ok, with free flow of drinks. Hotel transfer was ok, but I stayed in Kamari, so it took me almost an hour, if I knew it took so long, I will drive. Really fun tour with fabulous food. The only reason I did not rate this tour at five is that it is billed as including a swim in a hot spring. The water was quite cold. Despite the Weather conditions it was a memorable trip thanks to a great Crew and luxurious boat and the impressive Santorini views. Such a fun experience. We opted to go on the morning tour and it was perfect. The crew were friendly and funny. The views are amazing. It was so much fun laying out enjoying the sun, breeze and views as we headed to the hot springs, red and white beach. Because it maybe difficult to use public transportation to get to the three sites mentioned this half day tour is a great options, especially if you are on a time retrain. The lunch as very tasty and being able to check off swimming in the crystal clear water in Santorini on your bucket list is not a bad way to spend a day. Really relaxing and wonderful day. Food was great and never ending wine. the water was clean and very salty. Crew on the boat were professional and did a great job. Very relaxing day!